Articulate13: Hello Boys I’m Back! In 2005-6 I introduced Articulate Studio Pro software to the teaching staff at the University of Adelaide and for years it was used to develop what I call Interactive Learning Modules (ILMs). Then the iPad revolution happened with the need for HTML5 and not Flash to run on the tablets and Studio Pro became tired and in need of an upgrade. 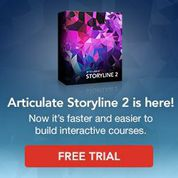 About a year ago Articulate released a superb new software product called Storyline. There has been a lot of buzz about it and it has become really more than software now and I wrote a blog entry in Mar 2013 called “Articulate Storyline: More Than Software It’s An Ecosystem” where I listed a great many websites and resources to support creative development using this tool. A few months ago Articulate released a major upgrade to their Studio suite of software, Presenter ‘13, Quizmaker ‘13 and Engage ‘13. The most exciting feature being they publish HTML5 tablet friendly output. I have been tracking closely all the interest in Storyline over the last year and was wondering why Articulate worked so hard on a new version of Studio Pro. [x_video_embed no_container=”true”] [/x_video_embed]So when I needed to develop a very important learning module, the first with my own content in 5 years, I took the opportunity to use the newly released Articulate Studio 13 Pro suite of software. I decided to push the envelope with pedagogy and use as many of the features to enhance learning as I could. I am impressed with what is possible and this post is about what I discovered. During the development I couldn’t help but think using this significantly upgraded software was sending a message to the elearning community a little like the classic memorable line from the Blockbuster movie Independence Day … “Hello boys I’m Back”! Learning Outcomes: I have to start with a clear definition of learning outcomes. This is not a special feature of the software but a must to get the best learning possible. Use Blooms Taxonomy, referring regularly to The Padagogy Wheel Learning Design Model and particularly the Grey Matter Grids mindsets. This will be invaluable to you when thinking how to build excellent ILMs. Checkpoints: are the core architecture or backbone of an ILM. This module has four of them. When I develop an ILM I believe there should be no more than 10 minutes of audio delivered content (didactic one way lecture style) before a checkpoint. This is an interaction and most often is knowledge checking using formative assessment, although it could be data mining with a survey or even an Engage style interaction. Teacher Bio and Email Link: Teaching using ILMs is always better in team and the teacher information can be changed by slide so learning can connect with the person actually doing the teaching. Email is a click away. Also you can build learning community by including a welcome video. How To Use The Module: I have used another Engage interaction to build a pop up interactive graphic. It is accessed from the tool bar top right hand corner. Its role is to give students an understanding of the Articulate interface environment and the learning benefits of using the features to the best advantage. Each new ILM will have a customized “How to” interface. Glossary: This has 430+ terms but more will be added later. It is accessible from the top right hand tool bar and is a global resource. I have also listed the Top 100 eLearning Tools for the current year as voted by eLearning professionals around the world. Each one with a link to an introductory webpage of its use in learning and teaching. Hopefully this will encourage people to explore the elearning landscape looking for better ways. Resources List: This feature is designed to upload documents that can be accessed by the learners. This is particularly useful for the text of scripts of the module voiceover and increases accessibility. Notes: I have also included the text of the voiceover in the notes area of each slide and included the text from each slide. Learners often find this helpful to read as the sound plays. Search Function: Having text notes enables the software to search not only all words on slides but the audio script as well. i.e. learners can search for a term the teacher actually said and it will pull up the slide with audio. This is a “biggie” as students/learners are not restricted to linear access and can find specific terms and concepts being taught – at least within a 2-3 minute slide audio. This benefit more than justifies scripting (committing to written text) what the teacher/facilitator says on the voice over. Resume Alert: This is a useful feature and you can use it to ask learners to take a break or carry out a task independent of the module and they can pick up the content where they left off. Engage Interactions: Three different interactive models and diagrams from the Engage ’13 were used. The main clickable circle diagram to describe the Centre concept on frame/slide 23 and the Glossary and How to diagram from the top tool bar. Engage ’13 has 20 different interactions. Formative Smart Game: A good investment to add some creative resources to your module development is a subscription to the eLearning Brothers Library. They have hundreds of cut out figures and templates for Studio ’13 including Quizmaker ‘13 templates. The World Race metaphor lends itself well to increase learner engagement to a formative assessment. Formative Quiz: The quiz on slide 20 forward was made in Quizmaker ’13 without a template. It is a very powerful quiz engine with many ways to increase engagement. Using cutout figures in different poses really helps. Instant Feedback: These interactive quizzes can give instant feedback to the choices and teachers can really support the learning with quality feedback – even to the wrong choices. Required Completion: You can set the quiz so the learner has to complete it before moving on. It does help learners stay on task. Online Survey + Video: This was a first and quite an “ah ha”. I realized you could embed a web object (any thing you can access from a browser) in the middle of a Quizmaker quiz. So the idea of putting an online survey mining data back to Survey Monkey is a great idea. Then I learnt you could embed YouTube Videos in Survey Monkey quizzes as well. Finally I discovered you could alter the embed code and clip a section out of a longer video. Important stuff because other methods use flash and won’t work on an iPad, The pedagogy I used works well on any device and now you can use video clips as discussion starters or part of assessment questions increasing engagement. Built in Evaluation: Using an online survey as an evaluation to be completed at the time the learner is doing the module is an advantage. There was a lot of work to develop this ILM using the features I have described above but I consider it worth it. I am extremely happy with V1 of this module. Yes I will change it further, I consider any ILM to be like software with versions – continually improving. My Conclusions and Lessons Learnt: I believe if you use PowerPoint and are very comfortable with it and the majority of your teaching is linear i.e. not simulations or scenario based learning then Articulate Studio ’13 Pro is the better choice for you than Storyline. If you are planning a lot of simulations requiring the branching feature then Storyline may be a better choice. You can do a lot more customizing in Storyline providing there is a little bit of the nerd aka programmer in you. However if you are a time poor overworked academic wanting to create stronger pedagogy with the minimum of new stuff to learn, then Articulate Studio ’13 will be an easier take up. I am planning to use multiple modules similar to the one described in this post as the backbone of a course embedded with other activities into learning sequences managed by LAMS. This will create more engagement, a better student experience and improved learning outcomes for the courses. I have a Dream: Because student feedback from assessments can be exported from Quizmaker quizzes in the TinCan API (the latest SCORM standard) I want to build effective elearning course/s to run from a WordPress website using a new plugin called Learndash. This is low cost, flexible and a LMS for the rest of us. I hope this has been a help to you and I invite you to look at the Pedagogy in action in the module itself by visiting “CALLED to Instruct Them in the Practice”. Contact me directly if you would like to know more of the “how to’s”.